So how do church communities manage to devote time and energy to both of these things? Much of the rest of Reading for the Common Good consists in developing an answer to that question. In Smith’s eyes, reading is “perhaps the most important component of learning in the twenty-first century” (p.17). Therefore, he argues that reading deeply and broadly as a community is one of the best ways for local churches to both continue in their discipleship to Christ and become better equipped to work for the good of their neighbors (p.17). So how do communities read in communion? Smith again draws upon the work of Fowl and Jones in this area. They suggest that this activity includes “three intertwined dimensions… reading the text, the text’s reading of us, and our reading of the world” (p.57). This first dimension (reading the text) is something that, hopefully, is already a natural activity for most churches. This step is fundamental because, “It is by reading and submitting to Scripture that we are shaped into the holy people that God intends us to be” (p.57). I think it’s safe to say that slowly and meditatively reading through Scripture as a church community is a truly essential habit for those who wish to embody Christ well in their local contexts. The second element described by Fowl and Jones is that of allowing the “the text to read us” (p.57). It isn’t enough to read through Scripture and then analyze it like a passive object. Smith argues that by “allowing it [the Scriptures] to ask questions of us,” we allow the transforming light of Christ to be shed more broadly into our lives, which conforms us more closely into the image of Christ and enables us to follow God more faithfully (p.58). [W]e must seek to discern and depict the social, economic and political relations that constitute the world. Therefore we need to interpret carefully the contexts in which we find ourselves, and Scripture informs and directs our efforts to make sense of these contexts. (p.59). I think this helps us better understand why reading is such an important practice in Smith’s eyes. Earlier in this post we highlighted the importance of both learning and action. Reading practices are aimed at transforming and equipping churches to join in the work of God in the world. It’s that last phrase (in the world) that I suggest matters here. If local congregations want to get involved, for example, in helping those in poverty around them in ways that empower and don’t just maintain systems of injustice and extend patterns of dependence, they will need to read deeply and broadly through both Scripture and other works related to poverty, sociology, and economics etc., so that they can wisely work for the flourishing of their more needy neighbors. We could continue to examine other examples like this and find that they make similar points, but instead I want to move on and bring up one last point made by Smith in Reading for the Common Good that struck me. Fiction and poetry also matter (p.60). It might seem that the line of argument pursued by Smith leads to a reading diet that consists strictly of academic prose, but he actually notes that “our reading should not be limited to instructive nonfiction. Literature that is done well, even popular fiction, often sheds at least as much light on ourselves and our world” (p.60). One of fiction’s strengths is its ability to grow our capacity to empathize with others who are unlike us. “Jane Austen’s novels, for example, allow us to in some sense imagine ourselves as living in the world of Victorian England, giving us a slightly different lens on societal and personal relationships than we might otherwise have (p.47). Poetry, which Smith calls “in essence, the art of noticing,” helps us to better cultivate an openness to beauty, “training us to imagine a future that is rooted in deeper sorts of beauty” (pp.48-49). In summary, Smith’s call for deeper congregational reading habits isn’t restricted to abstract works of scholarship. It includes all sorts of literature and imagines a community that is simultaneously fostering robust habits of reading and conversation (p.49). There are, of course, other good discussions raised by Smith in Reading for the Common Good that we could delve into if there was enough time. In this day and age, it seems audacious for someone to set forth a vision of how churches can work for the flourishing of their neighborhoods and cities, through as mundane a practice as reading and conversation, no less. One only needs to spend a few minutes browsing through the latest newsfeed to notice the deep, tragic brokenness present in the world today. Holding onto hope is difficult, and surely the Church can do a better job of listening to those who suffer and standing with them. At the same time, Christians need to hold onto the vision of ultimate renewal found in passages like Revelation 21:4, “he will wipe every tear from their eyes. Death will be no more; mourning and crying and pain will be no more” (NRSV). Working for the flourishing of churches, neighborhoods, and the world cannot be done without the empowering work of the Holy Spirit, and I think it’s a reasonable proposal to argue that reading is an important means by which the Spirit works. Reading for the Common Good makes a very interesting case for the communal importance of reading and conversation, and it paints a portrait of what local church life can be like that is well worth pursuing. I recommend it. *Disclosure: I received this book free from IVP Books for review purposes. The opinions I have expressed are my own, and I was not required to write a positive review. 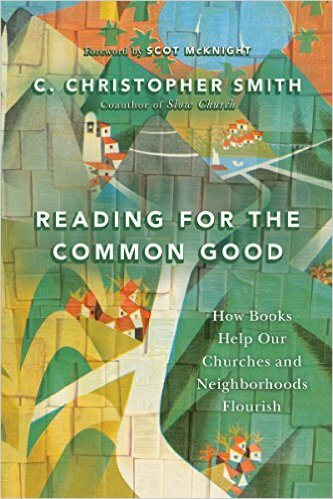 This entry was posted in Book Reviews and tagged Book Reviews, C. Christopher Smith, Flourishing, Hope, Reading, Reading in Communion, Social Practices, theology by joecrow91. Bookmark the permalink.